I was recently contacted and asked if I'd be interested in trying out one of the new Skinsense Sonic Cleansing Brush from BeGlow. I've tried a few cleansing brushes in the past but have never really been blown away by them however I was intrigued to try the BeGlow Skinsense Sonic Cleansing Brush because it works using pulsations rather than a typical rotating brush. The BeGlow Pura Skinsense Sonic Cleansing Brush is a waterproof and hygienic cleansing device that is designed to give the skin a more intense cleanse - removing make up, dirt and impurities. However, unlike the usual rotating cleansing brushes that are available this device uses 'SkinSense' technology with a silicone brush head that uses pulsations to help dislodge any dirt or residue on the skin. I personally like to remove my make up beforehand and then use this device to second cleanse; after I've applied my cleanser to my face i then lightly wet the head of the device, press the button once and lightly press it against the skin and slowly move it around my face in gentle upward strokes, i do this for a few minutes and then rinse and pat dry. You can push the button again and this returns it to standard cleansing mode - im not entirely sure what the difference between the two button settings are because it's not really explained anywhere so i just use the first one. This device is fully waterproof and the silicone brush head is replaceable but only needs replacing once a year and a full charge lasts up to six months; i feel like this is the ultimate lazy girl skincare product which i really like, it's so low maintenance and very quick and easy to use. Not to mention, the size of it means that if you are someone who travels a lot it won't take up much space and you plug the usb into your laptop to charge. One thing that i did find was that it comes with very little instructions and the instructions it does have, focuses more on the Be Glow Tia rather than the Pura which was a bit confusing. The device is pretty simple to use but i think each device should have it is own booklet rather than one that focuses more on one device that the other - I'm aware that, that is me being very pernickty but if I'd paid the retail price for this and it came with a booklet with more information about a product i hadn't bought than the one i did, I'd be annoyed. The first time i used this, i was a little underwhelmed as with lack of instruction i wasn't sure if i was using it right or what to expect. That being said, It did feel really nice on the skin, the pulsations weren't too intense and it felt pretty comfortable and it left my skin feeling very fresh and plump after using it. This is an expensive device retailing for £109 - on my own budget this isn't a product that i could afford to invest in however, that being said i do really like it and i think if you are someone who is into their skincare and wants to treat themselves, it's definitely worth looking into. They are available to buy from Lookfantastic. I feel like my skin has improved since using this as I'm getting a more thorough and deeper cleanse with it and removing all the rubbish that i might not necessarily get to when i cleanse manually and i much prefer the way this brush works than the typical rotating cleansing brushes I've tried in the past. It's very gentle and pleasant to use and so low maintenance. 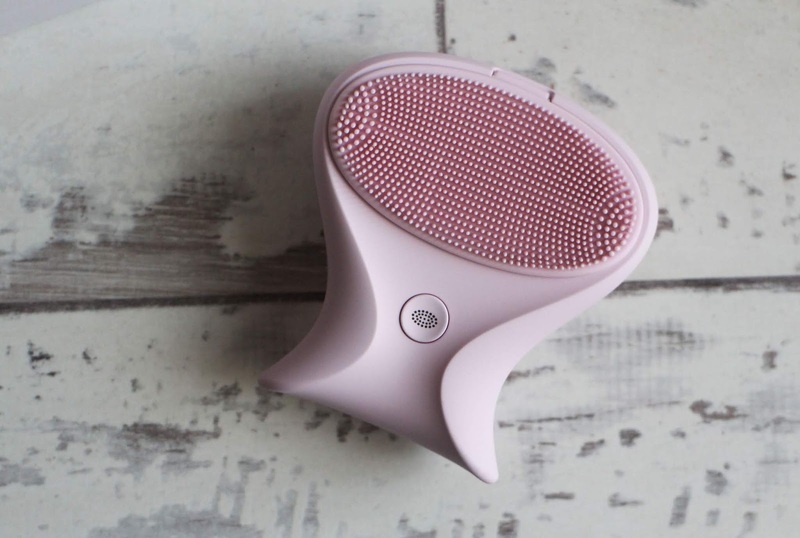 Have you tried the BeGlow Pura Skinsense Sonic Cleansing Brush?